Just clowning around? Police conduct wave of arrests of youths harassing passersby while dressed as clowns. A 15-year-old boy was arrested in Jerusalem on Wednesday by police for dressing up as a scary clown and terrifying passersby. Police are stepping up efforts against the recent phenomenon of “scary clowns” harassing citizens in recent days at various locations around the country, inspired by the recent "IT" movie dramatizing a murderous clown. On Monday, four youths dressed as clowns were arrested in Rishon Letzion in central Israel after they harassed passersby. They admitted to the charges against them and were transferred for further investigation. In addition, a young woman was found in a different region of the city dressed as a clown and was taken in for investigation. On Tuesday, two youths dressed as clowns who frightened passersby were arrested in Kiryat Gat in southern Israel. They claimed that they were simply playing a practical joke, but police decided to take them into the police youth department for investigation. 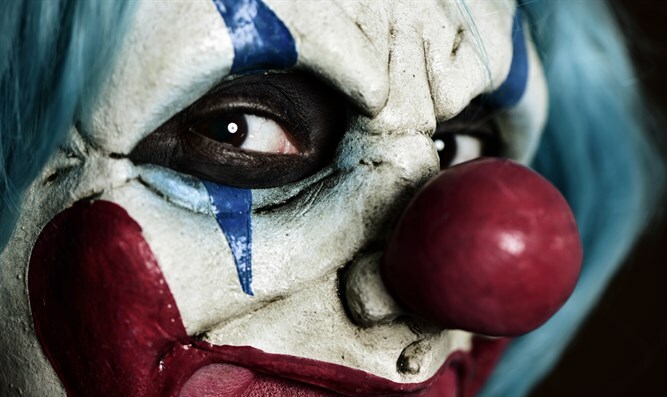 These cases come following the opening of an investigation launched last week in Dimona against four 12-year-olds dressed as clowns who were apprehended after they harassed local residents. In this case, due to their young age, the suspects were transferred to welfare authorities. "Those dressing up as clowns will encounter strict and uncompromising police enforcement," vowed police in a Facebook post.